Samsung this week formally introduced its 2019 Ultra-HD TV family. The new high-end televisions from Samsung all feature QLED backlighting and compared to their 2018 predecessors, have received audio and video quality enhancements. Select models will also get AMD’s FreeSync variable refresh rate tech along with Samsung's Game Motion Plus tech to remove blur and judder in fast-paced scenes. Finally, along with the new hardware, all of the new Smart TVs (as well as those launched in 2018) will receive the iTunes Movies & TV Shows app and Apple AirPlay 2 support (as reported), along with the new Universal Guide that is designed to allow users to discover content more quickly. Samsung’s Q900 series will remain the company’s top-of-the-range lineup, offering an 8K (7680×4320) resolution and coming in 65, 75, 82, 85, and 98-inch sizes. This year’s Samsung Q900-series televisions will be based on a version of the Quantum Processor 8K (briefly described last year) that not only upscales content to an 8K res, but optimizes “audio and video to the specific content” as well as tailors audio settings for the particular environment. At the 4K level, Samsung’s premium Q90 and Q80 lineups of 4K Ultra-HD TVs will get new panels, which are said to feature wider viewing angles (which the maker does not quantify), less glare, and better color reproduction. The latter would appear to be courtesy of a revamped backlighting system featuring quantum dots, as well as precision-controlled LEDs to enhance contrasts, which along with the Q90 and Q80 series TVs, will also be coming to the Q70 series. Meanwhile, starting with this year's models, Samsung’s QLED 4K TVs will be powered by the Quantum Processor 4K that upscales content to a 3840×2160 resolution and enhances its quality through various other algorithms. 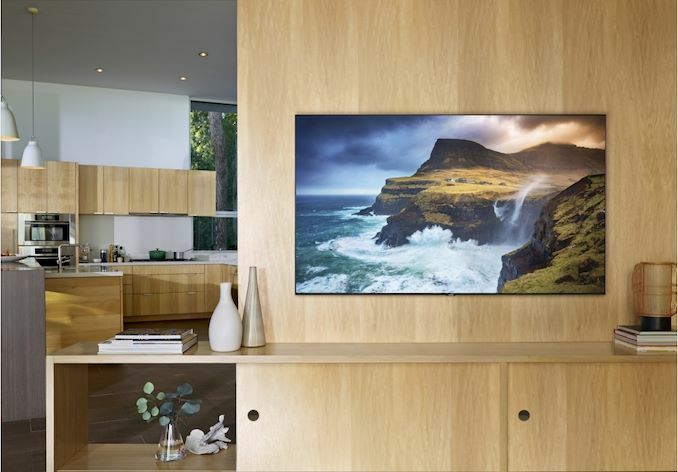 For customers who not only want a QLED-based Ultra-HD television but also want a completely different take on how those TVs should be styled, Samsung is rolling out its QLED Lifestyle 4K lineup. This consists of The Frame and The Serif models, where the former support interchangeable bezels (sold separately), and the latter is equipped with a stylish “post-modern” frame. 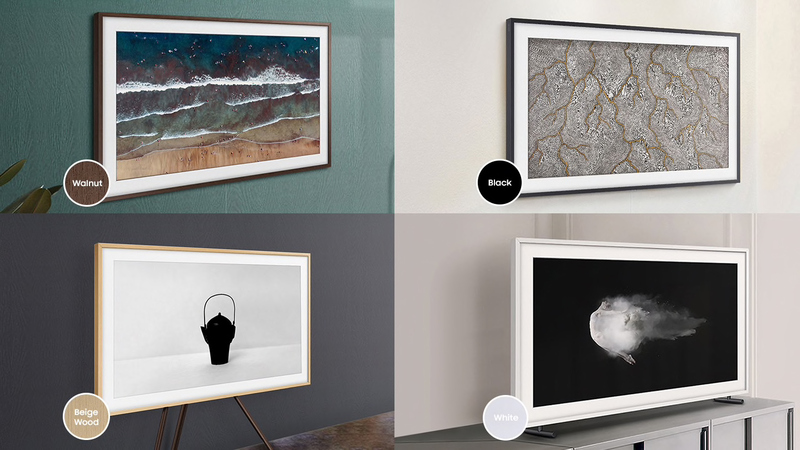 Both can display various works of art that can be obtained from Samsung’s Art Store in Ambient Mode (that is supported by all of Samsung’s QLED 4K TVs). 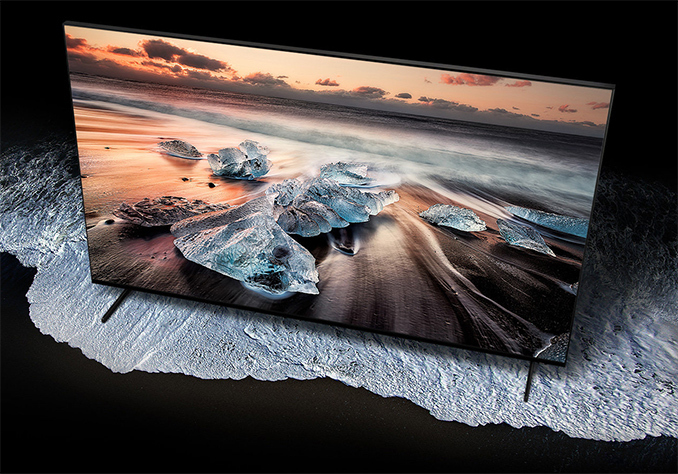 Last but not least, Samsung will also keep offering 4K Ultra-HD TVs without quantum dot-enhanced backlighting. The RU8000-series televisions will come in 49, 55, 65, 75, and 82-inch sizes, whereas the cheaper RU7100-series will feature 43, 49, 55, 58, 65, and 75-inch diagonals. Interestingly, the company will offer only two curved 4K models: the R7300-series in 55 and 65-inch sizes. 65”, 75”, 82” Quantum Processor 4K Ultra Viewing Angle: reduces glare and enhances color. 43”, 49”, 55”, 65”, 75”, 82” ? 49”, 55”, 65”, 75”, 82” ? ? 43”, 49”, 55”, 58”, 65”, 75” ? One of the things that catches our eyes with Samsung’s 2019 Ultra-HD TV lineup is the number of ultra-large displays, which measure 75 inches and higher. According to Samsung, which cites data from IHS Markit, there were 2.1 million 75-inch+ TVs sold in 2018. Furthermore, the market for such devices is expected to grow by 43% this year to 3 million units, before reaching 5.8 million units in 2022. As a result, with their latest generation of TVs Samsung is looking to capitalize on the demand for such large televisions by offering more ultra-large models than ever before. Yes, they have HDMI 2.1. However, it seems they can claim HDMI 2.1 w/o supporting everything that the 2.1 standard allows. Related to the original question - yes, the 8K TVs could play 8K (7680×4320) content if they support the 8K video type/encoding of the source. Only because it's cool to put an "AI" label on anything. This one might as well "learn" to do nearest-neighbor all the time for all we know. One thing's for sure, there no AI in any acceptable definition of it.